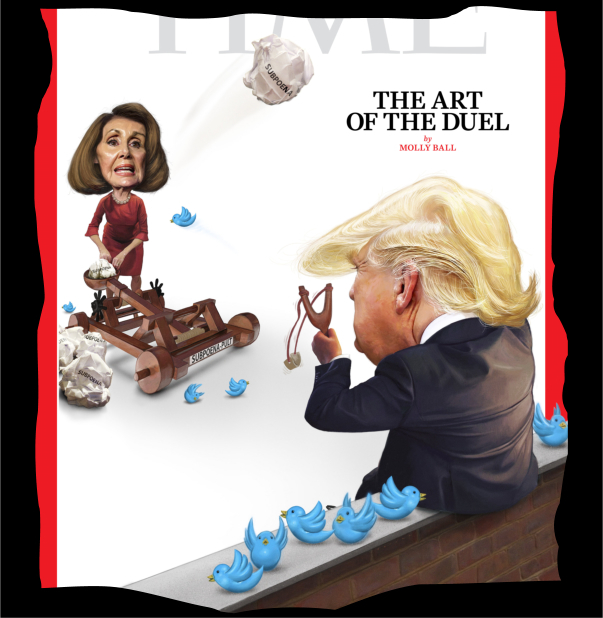 Together, the article and the cover were meant to make Nancy Pelosi look like The Great Leader, and President Trump like Humpty Dumpty, playing with tweets. Both the article and the cover failed for a variety of reasons. I will take you through them, starting with Molly Ball’s piece. Molly can barely type a sentence without making mistakes. The shutdown began Dec 22, 2018, which by the dawn of 2019 is 10 days, not 21. That happened Jan 3, so now you’re going back in time 19 days, but at least it was closer to the dawn of 2019. You are still three days out, however. 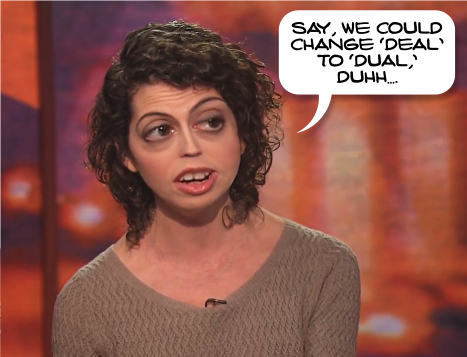 You just said Pelosi refused to cede an inch, and now you say she was negotiating. 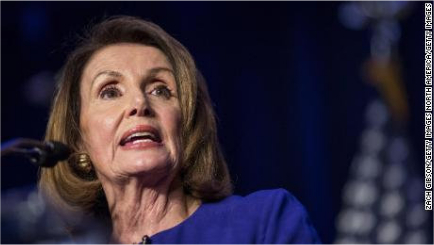 The truth is Pelosi is refusing Americans their mandated wall, or to negotiate. Airport-security personnel are working without pay. Wrong. Their pay is merely being put aside, and will likely be paid back with interest. 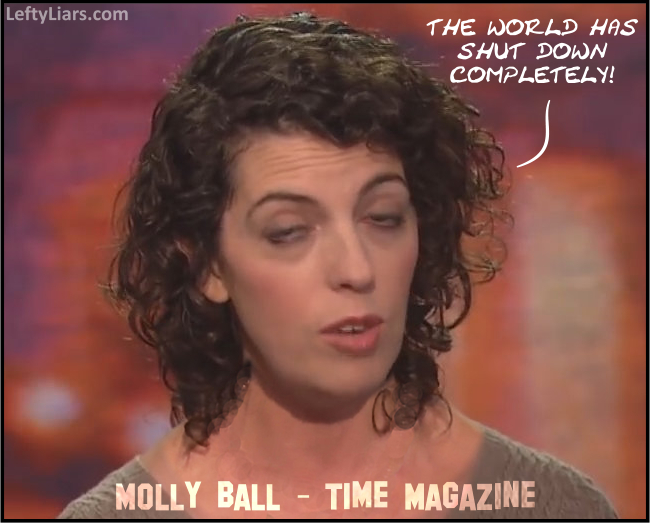 Perhaps Time Magazine should let their fact checker go over Molly Ball’s next article before allowing it out of the sandbox. Nonfunctioning? A non-essential 25% is closed. If a restaurant closed a quarter of its back rooms temporarily, who would say the restaurant was nonfunctioning? whose leaders, each insisting the stakes are too high to budge, have retreated to their corners. You may compare Trump with a boxer because he is fighting for America. Pelosi is the brat petulantly sitting on the floor with crossed arms, refusing to do anything. One towering figure; the other is a hell-hag fit only to be mounted and stuffed for use as a gargoyle. Trump defines this fight while Pelosi defines nothing. She refuses to do anything, and nothing people define zilch. Trump and Pelosi, the yang and yin of a divided America, two powerful leaders with their credibility on the line, both convinced they hold the winning hand. This is double-talk. To begin with, yin and yang are not divided but connected. Yin and Yang cannot exist without each other and are never separate. For example, night and day form a Yin-Yang pair. Trump’s credibility is not on the line, and Pelosi has no credibility, to begin with. Trump already won the “winning hand” in the form of a mandate to build a wall during the 2016 Presidential Election. He won the mandate that Pelosi will not honor. She is the thief trying to steal his four aces. 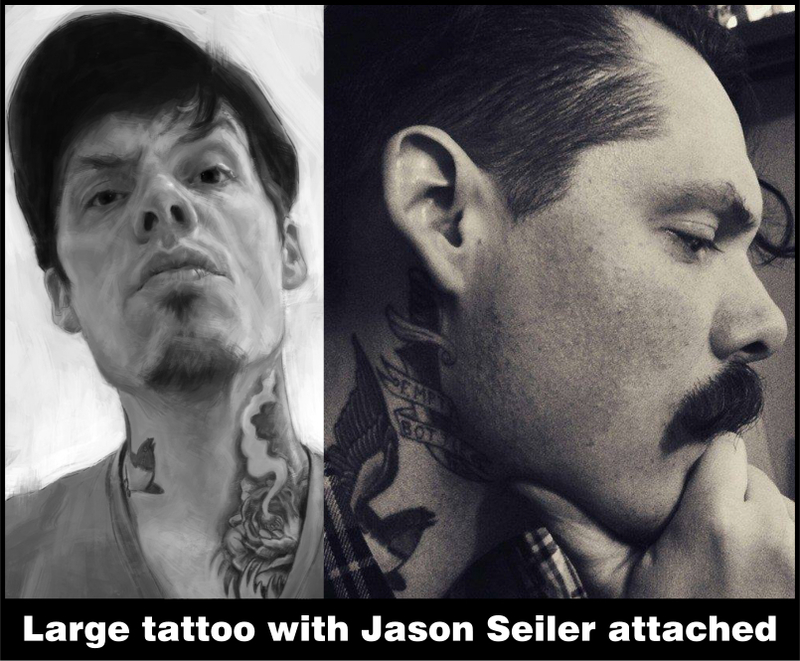 Jason Seiler lives in Chicago. He started an art course at the American Academy of Art in Chicago, a four-year course, and seemingly dropped out after two. It helps to explain a few problems with his cover art for Time. Starting with the artwork itself, Trump is sitting on a common suburban variety wall, made of bricks. To Seiler, a border wall is no different from his grandma’s garden fence. You can take it apart with a crowbar. Next; Trump’s hand fails anatomically. Taken from the net somewhere, Seiler squashed it onto the end of the arm, at the wrong angle. That is why you need those last three years of an art course and the life drawing that goes with them. Trump’s left arm is not extended as it would be if firing a slingshot. 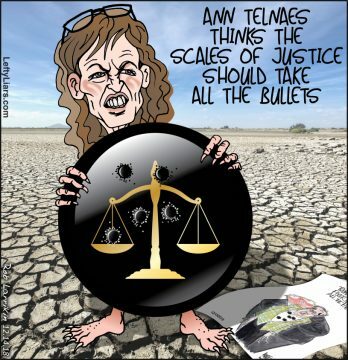 Pelosi’s catapult would not be loaded and cocked while her missiles were in the air, and her body was taken from someone who was either mixing salad or washing dishes. 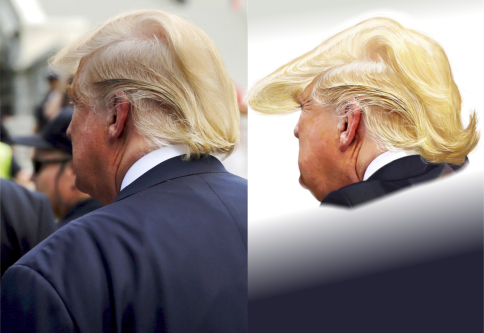 You can see where Seiler took his Trump head, using a Google Image search for “trump from back” without quote marks. At the time of writing it is the seventh image that appears. The photo is from this page. Here are the before and after images. 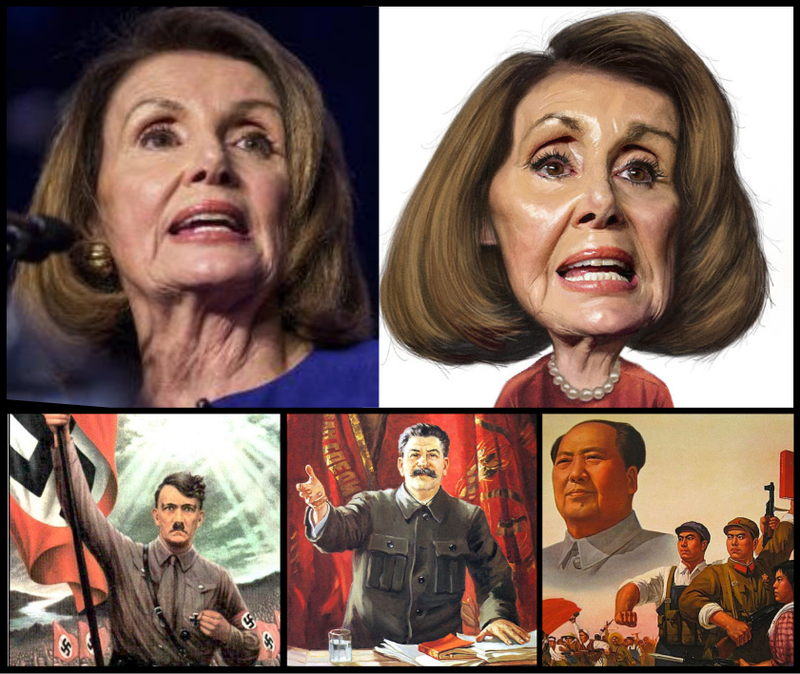 Pelosi was a little harder to find; she showed up in a search for ‘nancy pelosi’ about 230 photos from the top. 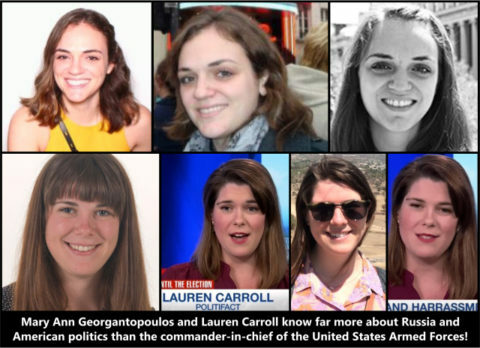 It links back to this CNN page. 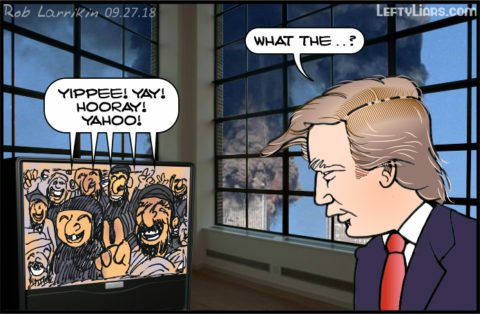 As for the theme, the only opponent shown is an old lady, but Trump has the entire media against him, including thousands of newspapers, magazines, TV stations, radio stations, online networks, bloggers, discussion boards, Leftist organizations, Google, YouTube, Wikipedia, all colleges and schools, Hollywood, millions of left-winged voters and the Democrats. Feminists, most blacks, Hispanics, Indians, Arabs, and Muslims oppose him. Environmentalists, socialists, communists, most criminals, and illegal immigrants are against him. Yet the only adversary shown in Time’s propaganda poster is one little old lady! 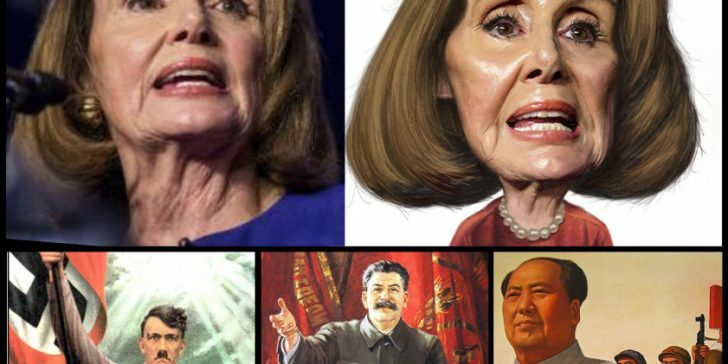 Finally, it was appropriate that our propaganda poster boy, comrade Jason Seiler, had comrade Pelosi firing screwed up subpoenas at her President. They are indeed screwed up.